On March 3 and 4 I will present the 33th (!) 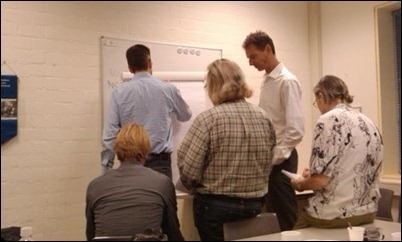 edition of an intense two-day workshop on the pragmatic use of UML modeling techniques (and beyond) with lots of hands-on exercises. Of course this workshop will cover smart use cases, domain driven design, service orientation and many other modeling techniques. Two day highly interactive workshop on modeling in software development projects using the techniques of UML and beyond…. A pragmatic YAGNI approach to modeling business processes and requirements. Modeling hierarchical and chronological business processes. Modeling traditional and smart use cases. Modeling activity diagrams (for use cases). Identifying test scenario’s for (smart) use cases using activity diagrams. Interaction modeling. Bringing together an applications structure and behavior, based on a pragmatic use case driven software architecture. Modeling service oriented projects using smart use cases. A brief introduction to model driven software development.